Crosswind Music, 2003. All Domestic and International Rights reserved. This is a collection of songs for children ages 0 through about 10 or so. The songs are mostly uptempo, participatory, and lots of fun. 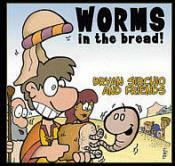 Musically, "Worms In the Bread!" is very similar to "Bugs For Lunch!" The primary difference between the two recordings is that "Worms..." is based mostly on stories and themes from the Hebrew Bible (what Christians often refer to as the "Old Testament"), and "Bugs" is based mostly on New Testatment stories and themes. I deliberately did not "Christianize" any of the lyrics in this collection so that Jewish children could enjoy these songs without being unnecessarily pointed toward the Christian scriptures. Parents--my apologies in advance if your kids want to hear these songs a whole lot more often than you do--especially in the car!!! But I hope and pray that you'll have a blast singing the scriptures together with the kids in your life! All songs written, recorded, and produced by Bryan Sirchio.